Lady Gaga is known for her outlandish ensembles — including her infamous meat dress and her fire-spraying bra — but this look may have outdone them all. The 27-year old performer stepped out in Berlin today wearing what looked like a giant chicken McNugget on her head. 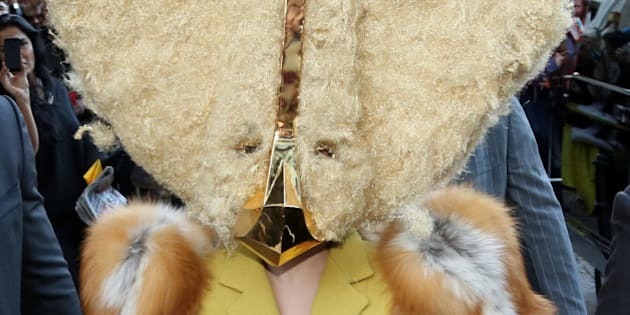 The massive triangular headdress, which was created by Charlie Le Mindhu, had a strange gold beak-like section with two small eye holes for Gaga to see through. The "Born This Way" singer paired the bizarre mask with a belted yellow coat with fur sleeves, which really finished off the chicken-like ensemble. 2day at AMPYA ARTPOP listening party in Germany I'll perform the world premiere of 'Gypsy' at the piano! Stream it tonight around the world! Gaga also said, "I'll be filming my beautiful berliners tonight as they hear ARTPOP for the 1st time! I cannot wait, so excited I might puke in my purse!!" The party will also be streaming live, so fans all over the world can partake in the festivities. Earlier this week, the "Applause" singer released her single, "Do What U Want," featuring R. Kelly and she's set to perform her new song, "Venus," on "The X Factor" this weekend. "ARTPOP" will be in stores on November 11. What do you think of Gaga's outrageous look?